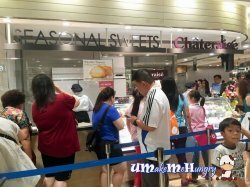 Chateraise is housed in the basement of Westgate Shopping Centre right inside Isetan and they are known for their sweets, pastry and desserts from Japan. 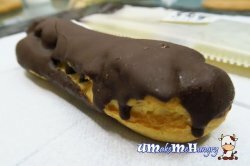 I came to realise the existence of the shop when my girl friend raved about their pastries and desserts, telling me that the whole family likes their swiss rolls as well as cakes. Recently, during a visit to my house, she caught hold of my stomach with "Double" Fantasy. It was then we start to believe that Chateraise was real good! As I was queuing up for my pastries & Cakes, I took a look into the chiller. They have assorted and varieties of cake to choose from. Some of the cakes on display were actually fake ones with the real ones kept in the chiller. With just a few glance, I would say these delicate little stuff can really blew my mind especially when I see the Happy Little Bear and Happy little Bunny. I just feel like adopting them, into my stomach. 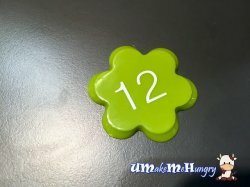 A number tag will be given to you once orders are made. Thereafter, we will show this to the cashier and he/she will consolidate and ask for payment. The transaction process is sequential which i felt quite good about it. Here's our buy! 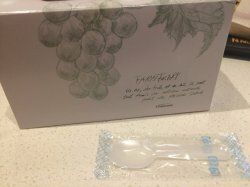 The pastry has individual packaging for handling. 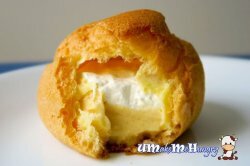 Double Fantasy has lived up to its name with 2 layers of cream inserted in the puff. 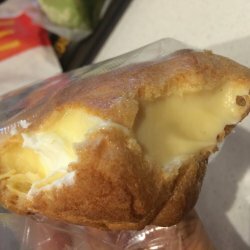 It crust was velvety soft, texture goes very well with the cream. 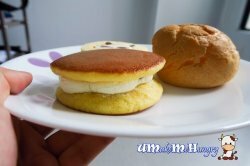 The first layer consists of fresh Hokkaido Cream while the second layer with egg custard cream. Yummy! The "Zebra" or mille crepe has 18 layers, soft and fluffy with fresh cream evenly spread in between them. It was yummy and came with a top layer of honey, a perfect go with the crepe. 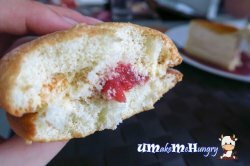 Simply love the combination of the two light fluffy pastry shells that is fantastically soft with strawberry cream cheese sandwich in between. 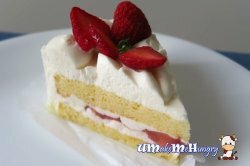 Mascapone cream cheese made in Hokkaido and home made strawberry jam made of Californian strawberries is being used here and its so yummy! 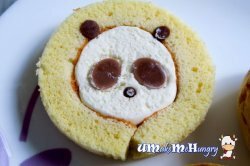 The Pandan Cream Roll was so adorable that I could not bear to eat it. 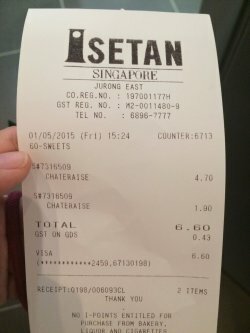 The Swiss Roll was very soft, better than my expectation and only costs $1.90. 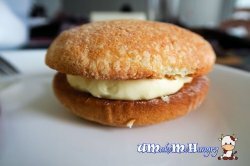 Fresh cream had sandwiched in between the roll with a comforting taste without having the thought of being too sinful. 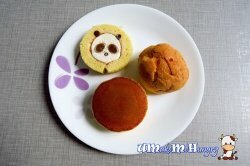 The pancakes with Azuki Bean & Cream threw another surprise to me. They were pillow soft. At the bite, it gave a burst of refreshing and satisfying taste. A matcha cake made to impress with a layer of red beans and chinese chestnut, elegantly created with starring shades of colors in its layer. 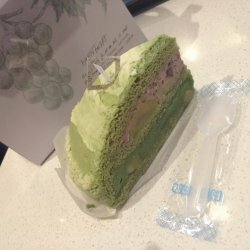 Sweetness was not too cloying and matcha cream was good enough. Airy light and spongy soft cake was the plus points to this piece of legendary cake while the luscious fresh red strawberries were juicy, giving bonus points to its name. 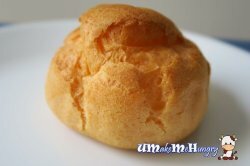 As a hobby baker myself, I am amazed by the softness level from Chateraise. 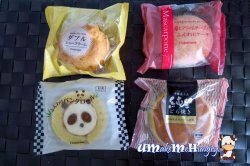 Though it may sound a tad expensive on the pastry but I would say buying that is money well spend as its quality and taste is good. 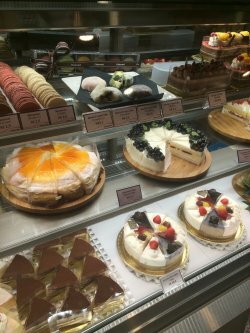 Located in Isetan wesgate, in the basement. 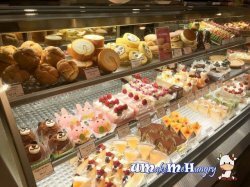 This is a small bakery right by the cash register of Isetan. 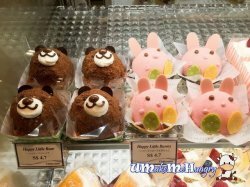 You can easily spot it with the long queues of Japanese and Korean mums queuing for these delicious sweet snacks! 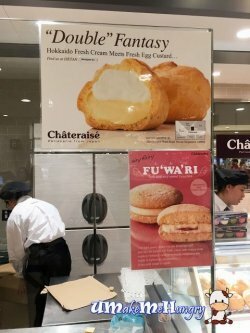 What is unique about Chateraise is that their original bakery is located near Mount Fuji and so they get fresh milk and premium eggs from neighbouring region. 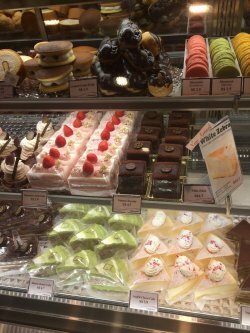 The sweetness of the pastries are also said to be result of them using the waters of Mount Fuji. 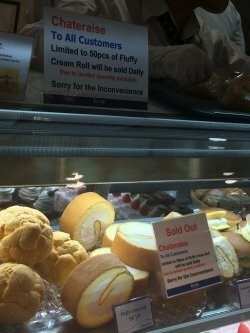 I heard about their fluffy cream rolls, bu at 3:30pm on a friday, they were sold out! 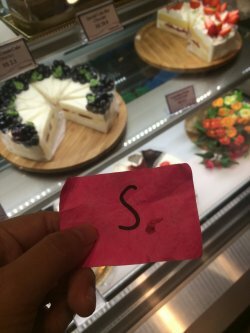 After you the staff your order, you will get a piece of paper with an alphabet. The staff will proceed to pack your order into boxes and at the payment counter, hand them the alphabet paper and make payment. 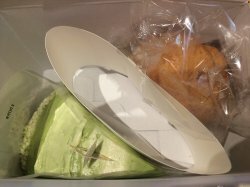 I got a cream puff and Matcha Bombe cake to try, I really wanted to order one of everything!~ I will be back for more! 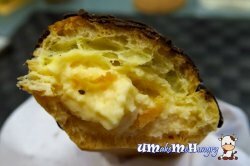 Cheaper than your typical beard papa, it is so filled with cream, every bite, forces the custard and cream to come oozing out! 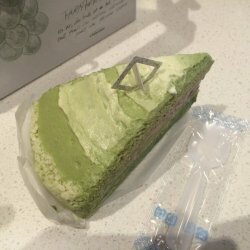 The green tea flavour in this cake is delicious, not too artificial and yet not too bitter. There is a layer of red bean buttercream and also a later of chestnuts! The chestnuts are a delight to bite into. For $4.70, I think this cake is worth every cent of the price tag! As they are inside Isetan, you can use your Isetan membership card for your purchases!